AA Degree in Dance: Barton is one of the only community colleges in the midwest offering an Associates of Arts Degree in dance. For a student who has the desire to enter a four year school as a dance major, this program provides the foundation needed to succeed. Student Dance Company: Our resident student dance company, Barton Dance Theatre, performs in the fall at the Wichita State University in the Kansas Dance Festival and on the Barton County Campus in the spring. Throughout the academic year, BDT will have various additional opportunities to perform within the community. Auditions for BDT will be held twice a year at the beginning of fall and spring semesters. Beginning Dance Classes: Barton's dance program offers classes for beginning dance students wanting to explore dance in a welcoming safe environment. Dance Academics: at Barton, students have an opportunity to take dance academic courses such as History of Dance I and Dance Composition I to engage in a comprehensive study of dance as an art form while preparing to transfer to university dance departments. These classes give students an opportunity to look at the “bigger picture” of the dance world and develop their own creative voice as a choreographer. We welcome and invite high school students and adults from the community to join dance technique classes for personal enjoyment. Barton specifically offers lunchtime and evening classes to be available to working adults. 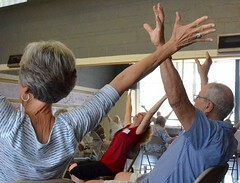 Our program has unique movement classes designed for seniors to help increase balance, promote better posture and develop a stronger mind-to-body connection necessary for mobility. See Dancing for Mobility (DANC 1003) in dance class options offered through the Silver Cougar Club. 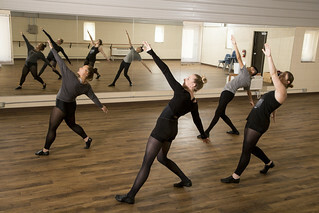 Modern Dance is an expressive style of dance where students learn how to use dance and movement as a form of non-verbal communication through studying multiple diverse techniques. Modern Dance I & II are dance major requirements. In ballet class, students will gain strength, flexibility, balance, muscle control, and musicality related to movement. All levels of experience welcome. Ballet I & II are dance major requirements. The energetic style of Jazz Dance teaches a variety of dance steps, coordination, rhythmic control, and different techniques from early jazz styles to contemporary jazz. A great class for musical theatre! Barton’s student dance company offers dance students a better understanding of what it is like to work in a dance company. In BDT students will learn, rehearse, and perform multiple styles of technical dance at a variety of venues and engage in dance education experiences such as dance field trips to see professional dance companies perform. Excellent performance scholarships available. To be considered for company placement dance students must have at least 2 years dance experience and plan to register as a Barton student in Fall 2018. Why did people start dancing anyway? How did dance equal political power in the royal court? Where does Hip Hop come from? Do you really have to move your belly in Belly Dance? Learn these answers and more in this interactive dance academic class! This class is open to all students, regardless of dance experience. This class is a dance major requirement and fulfills BCC’s Humanities requirement. This dance therapy class helps aging adults maintain mind-to-body connection, improve balance, increase memory and have a good time while learning a variety of dance styles in a safe environment.